1962 (January 31): Ronit Singer was born in Tel Aviv, Israel. 1978: Singer wrote the play Dolls, which was produced in several Israeli cities. 1982: Singer served in a non-combatant position in the Israeli Army during the Lebanon War. 1983: Singer emigrated to New York, where in the following years she studied theater at the HB Studio. 2001: Singer healed spiritually and physically her friend, New York artist Dafna Mordecai, who persuaded her to teach students in individual sessions. 2006: Singer started teaching group meditation courses. 2010: Singer reported that she was told by her spirit guides to include movement into her classes. She moved to larger premises in downtown Manhattan, equipped with yoga mats, and learned Hatha Yoga from her student Michelle Lovett. 2010: The Oneness Center was admitted into the Yoga Alliance as a Registered Yoga School. 2011: Singer started teaching Embodiment Yoga. 2017: The first Oneness Center retreat outside of the United States was held in Nicaragua. In one of the most radical transformations of spirituality in Western history, each week millions of North Americans, Europeans, and Australians/New Zealanders attend spiritual seminars and courses, creating informal networks of centers and classes. Whether each center declares itself “religious,” “spiritual,” or “none of the above” is often a simple matter of convenience, which is also influenced by governmental regulations and tax laws (Heelas 1996; Heelas and Woodhead 2005). Although these centers are typically eclectic and draw from various traditions, their teachers do have lineages and references. A great number of centers throughout the world are inspired by Kriya Yoga, one of the traditional forms of yoga, which became popular in the West through the immensely influential book by Paramahansa Yogananda (1893–1952), Autobiography of a Yogi (Yogananda 1946). Particularly outside the SRF, lineage is not always crucial in Kriya Yoga. The encounter with Babaji can happen on the metaphysical plane, or teachers can channel him, although some claim to have seen and even photographed his physical form (Phipps 2002). The name “Oneness Center” has been adopted by several different and unrelated organizations in India, United States, and Europe, within, and sometimes outside, the Kriya Yoga lineage. In this profile, “Oneness Center” refers to the organization incorporated in 2009 in New York as The Oneness Center of the Order of Love, which has no relations with other organizations that also use “Oneness” as part of their names. In New York, she further cultivated her interest in theater, and had her play Dolls produced off-Broadway. She studied theater at New York’s well-known HB Studio and, although she never met him personally, was fascinated by the theories of Polish theater director Jerzy Grotowski (1933–1999). Grotowski regarded acting, which he compared to ritual, as an expression of our deeper emotions through embodiment (Fischer-Lichte 2008:82). 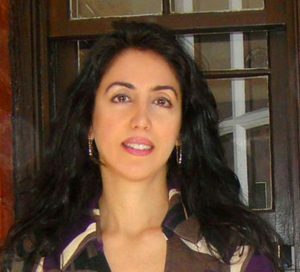 In personal interviews (2018), Singer told me that at age six, while she heard Zoroastrianism and Ahura Mazda mentioned in primary school, she had a spiritual experience of Sanat Kumara, who also came to be venerated as the Head of the Spiritual Hierarchy in post-Blavatskyan Theosophical Society (Leadbeater 1925:361). He became part of Singer’s spiritual world, which she claims continuously flows and talks to her in what, for lack of a better word, can be called channeling. In this flow of channeling, another character who appeared early in Singer’s experience was Melchizedek. She sees him as the one who brought the White Light to our Planet, and compares his role in her channeling to the strings in an orchestra, while Sanat Kumara is more like the drums. Singer does not talk very much in public about Babaji, although it is clear that encountering one of his photographs when she was still in Israel (she never visited India) opened the way to his central role in her channeling. And it is to Babaji she mostly refers to when asked about her spiritual lineage. But Singer doesn’t only hear from Sanat Kumara, Melchizedek, and Babaji. They are portals (as are others, including the Christ Consciousness and Francis of Assisi) to a higher dimension, which we may call Oneness or God, and each of us may eventually find his or her own portals. In 2010, the Oneness Center was admitted into the Yoga Alliance and became an official RYS (Registered Yoga School). In 2011, Singer started teaching what she calls Embodiment Yoga. This led the Center to expand its activities and increase the number of students. In 2017, the first retreat of the Oneness Center outside the United States was organized in Nicaragua. It is important to emphasize that how Singer receives the teachings is almost never mentioned in her classes. The content of the teachings and that they work for the students is regarded as more important. Her signature teaching, known as Embodiment Yoga, is aimed at attaining and mastering an ever-evolving state. It is taught in four non-linear levels, which means that students may tap into all four levels at the same time. The first level is called “Entering Translucent States of Awareness,” and is aimed at reaching states beyond the limitation of the self, including learning to “locate and release physical, emotional and mental blocks and to deepen our connection with universal flow.” The second level, “Mastering the Self and Mastering Awareness,” is premised on the idea that, “to go beyond the limitations of self, one should first realize the self: the tapestry of beliefs, attachments and the building blocks of one’s reality,” and nurture a dialogue between perception, experience, and expression. The third level is called “Embodying and Living in Cosmic Flow,” which means “to master the language of energies and the ability to communicate with life through the wisdom of universal flow. As we let go of self-concepts and past perceptions, our practices, as well as our lives turn into a multidimensional space that takes us beyond what we know.” The third level flows naturally into the fourth, “Ascending into Ever-Evolving Reality,” where the student becomes attuned with the universal, cosmic evolution. As students advance in understanding and embodying the teachings, they experience empowerment. “Clarity, Singer claims, becomes clearer, awareness seems richer, and reality is experienced as an ongoing movement turning into living wisdom as it enters your body, brain and the energy fields around you” (Singer 2016). As usual, the perception of the outsider scholarly observer (“etic”) may differ from the practitioners’ (“emic”). From my own “etic” point of view, there are three central features to the Oneness classes. The first is “cognitive realization,” which Singer calls “the new kid on the block of evolution.” It is the language of the brain expressed through thought and speech. Singer uses it for expanding awareness. 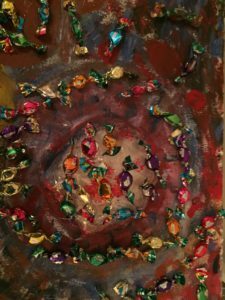 The unexpressed becomes expressed, at times using surprising tools such as the copyrighted “Looking Glass cards.” Each card corresponds to a cognitive realization concept, and picking up one is the starting point of a meditative journey. The central part of the Oneness Center’s experience is Embodiment. Thinking is different from experiencing (although a thought can be experienced). 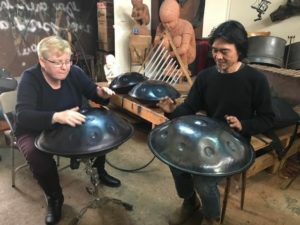 In a typical beginners’ class, students are encouraged to pick a thought or memory, locate it in the body, feel how it feels (sensations, colors, textures), and then “invite” this place to express itself through movement and sound. 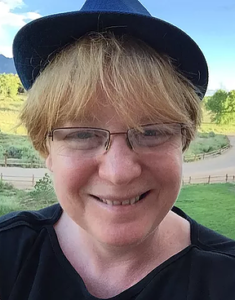 In my participant observation, conducted in New York between 2016 and 2018, it emerged that Singer’s charisma led students to the Oneness Center, as they recognize her as an “enlightened spiritual master.” The main new insight or the “gift” students believe they receive from her is Embodiment. This is described as learning how to experience deep memories as body sensation, how to feel and express blocks and pains and joys in the body, how to connect the body with universal and earth energies, and how to restore the body and mind to their natural state of flow. While Singer does not believe that artists need training to create magical and moving work, some at Oneness Center are professionally trained. They include the already mentioned Center’s Director of Student Affairs, Dafna Mordecai, who studied at the prestigious Parsons School of Design of The New School in New York (Interspiritual Dialogue ‘n Action 2002). Students at Oneness Center come from all over the world. They sit in one of the groups with first and second-generation immigrants and citizens from ten different countries. In fact, students range in ages from people in their early twenties to those in their late seventies. 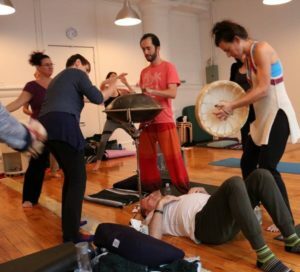 Classes are offered only in Manhattan, but Singer also conducts retreats in other American cities and, from 2017, abroad. In my own participant observation, one interesting feature I noticed is that some of those who attend Singer’s classes are spiritual teachers themselves. One lady I interviewed channel angels and offers a range of spiritual services. She told me that she comes to the Oneness Center to “recharge her energetic batteries” and to learn to do what she does with joy and love. While some students during the years left the Oneness Center, they normally did so without ill feelings. The Center did not encounter any significant opposition, but it faces the issues and challenges of many other groups with a similar structure. In 1985, in one of the most famous texts of twentieth century sociology of religions, Robert Bellah (1927–2013) and his co-authors coined the word “Sheilaism.” A nurse they called Sheila Larson claimed she didn’t attend any church but believed in the religion of “loving yourself and being gentle with yourself and taking care of each other.” They saw in these individual spiritualities (“220 million American religions, one for each of us”) the future of religion in America (Bellah, Sullivan, Madsen, Swidler and Tipton 1985:235–36). The “Sheilaism” hypothesis was extremely influential. Pope Benedict XVI, who is certainly familiar with the classics of sociology, may have kept it in mind when he attacked “self-religions” and “do-it-yourself” religions as superficial (see e.g. Benedict XVI 2012). Others, however, argued that the Sheilas of this world, rather than “not building community” as Bellah’s book argued, would likely come together in new kinds of spiritual communities, very much different from traditional religions. In 1996, British sociologist Paul Heelas, who had first popularized the expression “self religions” in 1991 (Heelas 1991), noticed how followers of Sheila-type non-denominational “religions of the self” gathered regularly for seminars and classes, creating a new type of “seminar religion.” It was very different from traditional religion, but it was not really outside of the world of religion, and did create “religious” communities (Heelas 1996). The 2009 incorporation as a “church” was the answer to a legal need. “Spiritual center” is a more appropriate description. But the reference in the legal name (“The Oneness Center of the Order of Love”) to an order is, in my opinion, significant. The journey proposed by Singer is typical of Western (and Eastern) esotericism and it would not be inappropriate to call at least the core membership of Oneness Center an esoteric order. Studying groups such as Oneness Center is significant, not so much for their present size (although they have a potential for growing and globalizing) but rather because they are representative of how many urban professional Westerners live spirituality in the twenty-first century. There are thousands of such centers in the Western world, but Singer’s teaching of embodiment makes Oneness Center part of the cutting edge of this global phenomenon, where a culture of the body is increasingly occupying the center stage. And this gives her hope that the Center may expand from a New York phenomenon to a national and even an international one, a goal Singer is now actively pursuing. 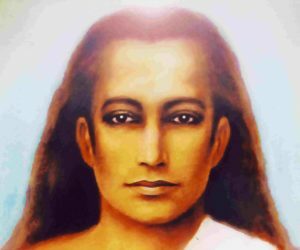 Image #1: A picture of Babaji. Image #5: A class at the Oneness Center. 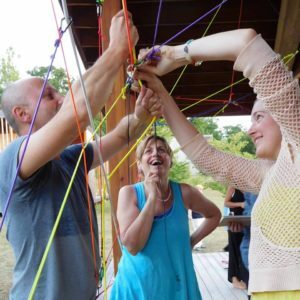 Image #6: Students at a Oneness Center retreat. Image #7: Ronit Singer teaching drumming. Image #8: Art by the Center’s students. Image #9: Students expressing themselves through drumming. 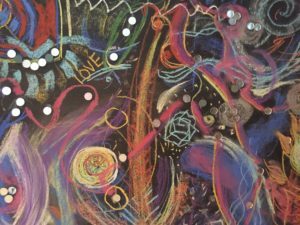 Image #10: Art created by the students as a collective enterprise. Bellah, Robert N., William M. Sullivan, Richard Madsen, Ann Swidler and Steven M. Tipton. 1985. Habits of the Heart: Individualism and Commitment in American Life. Berkeley, Los Angeles and London: University of California Press. Benedict XVI. 2012. “General Audience, October 17 2012.” Accessed from https://w2.vatican.va/content/benedict-xvi/en/audiences/2012/documents/hf_ben-xvi_aud_20121017.html on 27 May 2018. Fischer-Lichter, Erika. 2008. The Transformative Power of Performance. London: Routledge. Heelas, Paul. 1991. “Western Europe: Self-Religions.” Pp. 167–73 in The World’s Religions: The Study of Religion, Traditional and New Religion, edited by Peter Clarke. London: Routledge. Heelas, Paul, and Linda Woodhead (with Benjamin Seel, Bronislaw Szerszynski and Karin Tusting). 2005. The Spiritual Revolution: Why Religion is Giving Way to Spirituality. Oxford: Blackwell. Interspiritual Dialogue ‘n Action. 2002. “Our Artist: Dafna Mordecai.” Accessed from http://multiplex.isdna.org/newpage26.htm on 27 May 2018. Leadbeater, Charles Webster. 1925. The Masters and the Path. Adyar, India: Theosophical Publishing House. Oneness Center. 2017. 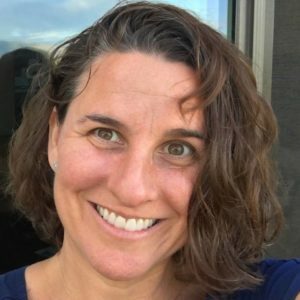 “Meet the Team.” Accessed from https://www.onenesscenternyc.org/about on 27 May 2018. Phipps, Carter. 2002. “In search of Babaji: WIE tracks down the elusive Yogi-Christ of the Himalayas.” What is Enlightenment? 21:78–89, 162–66. Singer, Ronit. 2016. 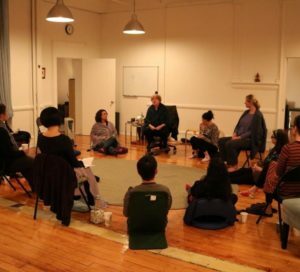 “The Embodiment Yoga Experience as Described by Ronit.” Accessed from https://www.onenesscenternyc.org/embodiment-yoga on 27 May 2018. Yogananda, Paramahansa. 1946. Autobiography of a Yogi. New York: Philosophical Library.